Many Latino immigrant families came to this country with one objective: a better education for their children. But in the newly released test scores, English learners in LA Unified posted no growth at all for the second year in a row, and Latino students had one of the lowest growth rates among all other ethnic groups. The California standardized test results released Wednesday showed a stagnation in the progress of these groups not only in Los Angeles but statewide, heightening concern in the community. In LA Unified, where Latinos make up almost three-quarters of all students, they showed less than 1 percentage point growth compared to last year in both English language arts and math proficiency. At the state level, they showed no growth at all compared to last year in the standardized state test scores, called the California Assessment of Student Performance and Progress (CAASPP) and also known as Smarter Balanced tests. The district’s overall average this year was 39.55 percent in English language arts and 29.86 in math. The state’s overall average this year was 48.56 percent in English language arts and 37.53 percent in math. Whites and Asians in LA Unified posted no gains this year, and while African-Americans showed the most improvement, their scores still trailed all other groups. Overall, LA Unified’s scores continue to fall below the state average, even though its students posted slightly better gains. In LA Unified, where 25 percent of the student population is classified as English learners (ELs), this group didn’t show any improvement at all for the second year in a row. From 2015 to 2016, there was no growth in math and only 1 percentage point in English language arts. The near-stagnant scores last year caused deep consternation in the district, with one board member saying “the data is miserable.” In math, English learners have shown no growth in the last three years, with only 5 percent of them meeting or exceeding standards since 2015, when the tests were first given. In English language arts, this group has shown only a 1 percentage point increase since then. California’s English learners’ scores were roughly double LA’s. Statewide, nearly 10 percent of English learners met or exceeded the English language arts standards, and more than 9 percent did so in math. “Parents need to be informed about this data and need help to better support and advocate for their children. Schools and districts need to focus better on our students,” said Maria Brenes, executive director of InnerCity Struggle, a community advocacy organization in East Los Angeles. “It’s extremely important that schools and the district inform the parents about these data and provide them the information, the motivation, the tools to know how these results affect their kids and how can they help to improve them,” she said. Brenes said more resources need to pour into helping English learners than they currently get. Under the state’s Local Control Funding Formula (LCFF), extra money is allotted for English learners. But she said it’s not enough. Maldonado highlighted one improvement in the test scores made by “former English learners.” “When you separate the reclassified students from the whole English learners group, you can see the improvement and that they have achieved proficiency in language that outperforms their English-only counterparts,” she said. Reclassified English learner students make up 25 percent of the overall student population in the district. 30 percent in math, higher than the state’s 23 percent. The only significant increase for Latino students this year is the number of them taking Advanced Placement tests. That number went up 6.5 percent for Latinos and about 3 percent for African-Americans. The number of Latino students achieving a score of 3 or higher (a 5 is the top score) grew from 54,000 to 82,500. Scoring a 3 or above on an AP test allows students to qualify for college credits. One parent advised other immigrant parents not to become discouraged. “Let’s not forget that this is the third year of the new standardized tests in California. 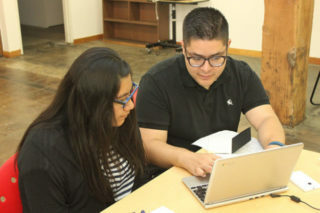 This is a new, very competitive testing system from a more rigorous curriculum, so let’s not get discouraged by the results,” said Susana Zambrano, a parent leader with the immigrant advocacy group CARECEN in Los Angeles. This is the third year that California has used the computer-based tests to measure students meeting the academic standards. The tests include writing clearly, thinking critically, and being able to solve complex problems. The tests were conducted in May. A total of 3.2 million students participated in grades three through eight and grade 11.